I bought this in a thrift store recently. It wasn´t possible to listen to the record in the store but “boogie” sounded interesting enough to spend one Euro on it. I really like these two boogie tunes. With repeated listening I have the feeling that they do stand out in the field of German jazz and rock´n´roll recordings in the 1950s. At least I can´t think of any other record that bridges the gap between those two styles better than this one does. I guess a big part of it was then 20 year old Ingfried. As the label states this release was a special “new talents series” (Nachwuchs-Serie) so he must have jumped at the chance to record one of his own songs for his first record. Back then most other young artists in the pop business had to record the material they were given. 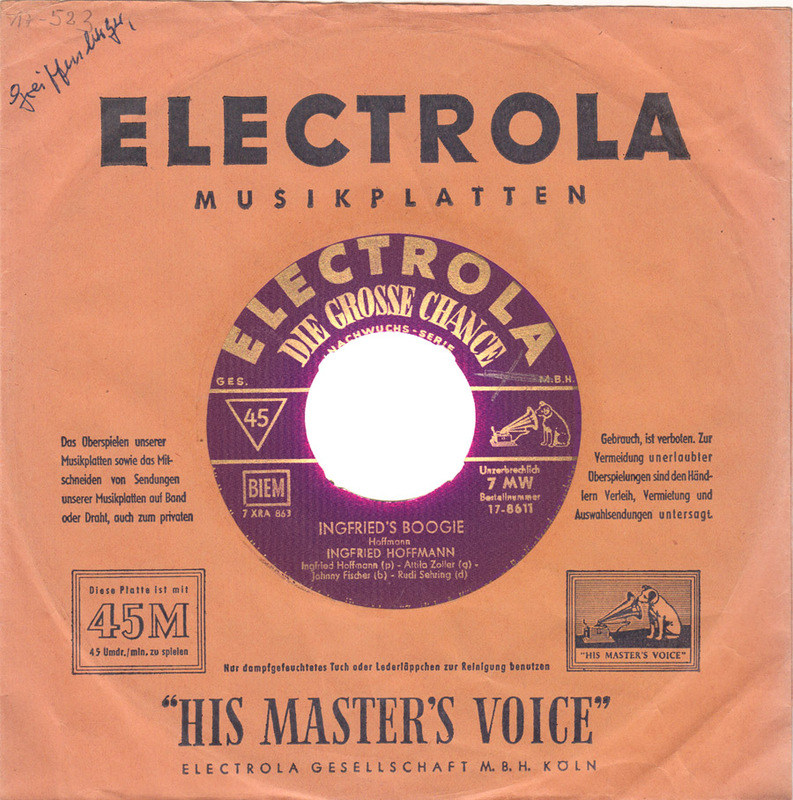 While I do enjoy the period charm of records made by the likes of Ted Herold, Paul Würges and Ralf Bendix, their music was schlager first and rock´n´roll second. In contrast these two instrumentals come much closer to the rhythm & blues roots of rock´n´roll. For some reason they have never been re-released, probably because they are so singular. With what to pair them with? Hoffmanns version of Rimsky-Korsakov´s “Flight Of The Bumble Bee” predates the 1959 hit for B.Bumble & the Stingers ( Earl Palmer, René Hall and Plas Johnson) and is cleary inspired by the lightning-fast 1946 swing arrangemet of Freddy Martin and his Orchestra. Also I already have another great record by Ingfried Hoffmann, “Hammond Organ” on the Czech Supraphon labeI. The two Songs “TV-Swing” and “Soul Twist”, recorded in Hamburg in 1963, are great modern Jazz with a pop twist. They have been re-released in 2007 on the “Hammond Bond – Jazz For Secret Agents” CD. In the 1960s Ingfried Hoffman went on to play with Klaus Doldinger and became of the most prestigious European jazz pianists. In 1970 Hoffman quit performing altogether to focus on composing and arranging. One of his most famous melodies, at least to the german audience, is the title track to the german Sesame Street. Das ist aber schön, dass du wieder deinen Blog weiter schreibst. Hab x-mal traurig auf deinen letzten Beitrag “Swing-Tanzen auf dem Tempelhofer Feld” aus dem letzten Jahr geschaut und gedacht: “Na, bei Schnee, Wind und Wetter? Vereistem Boden? Der wird doch nicht …” Ein Glück bist du nicht angefroren oder deine Finger ab-! Jungejunge, das wär ja was! Toi, toi, toi – klopf auf Holz. Sehr gut! Rock on und hau in die widerständigen Tasten! Jetzt erst recht! aber die Tasten töten mich wirklich. schön, dass Sie wieder da sind und man nicht nur Ihre Artikel in der “Jungle World” lesen, sondern auch das eine oder andere Musikbeispiel hören kann. Ingfried Hoffmann komponierte übrigens auch die Titelmelodie zu “Robbi, Tobbi und das Fliewatüt”, jener wunderbaren Abenteuerreise eines gewitzten Jungen, der auf Eltern, Schule und andere Autoritäten keine Rücksicht nehmen muss und einfach aufbricht mit seinem neuen Freund, einem manchmal leicht cholerischen Roboter. Am Ende bringen sie die Aufklärung ins (katholische) Schottland und entlarven den Spuk in einer dreieckigen Burg als miese Inszenierung.